Pan Asian fusion in Park Slope helmed by Dale Talde of Top Chef fame. 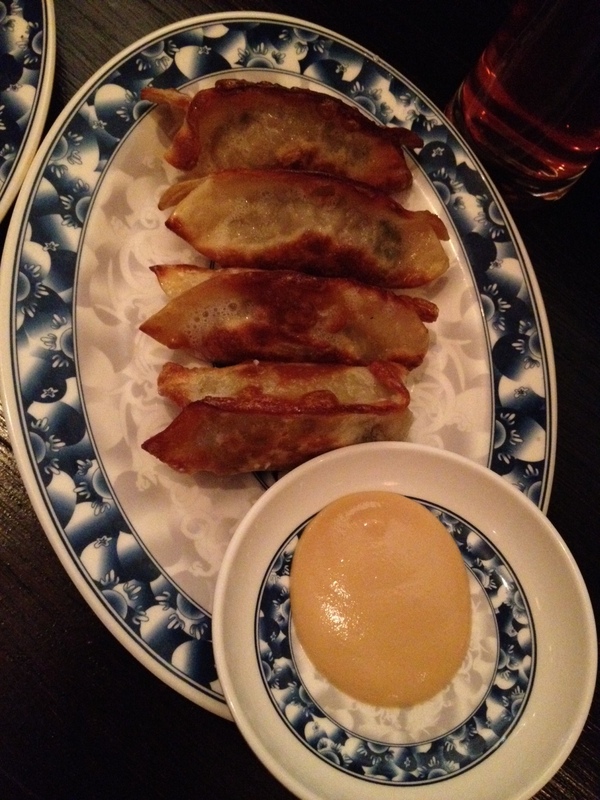 Pretzel Pork & Chive Dumplings w Spicy Mustard – Right off the bat, our favorite dish of the evening. Dumplings are always welcome, and it’s really rare to find a dumpling that wows. These are just such dumplings. Incredible depth of flavor, with a really cool slight pretzel aftertaste. Don’t worry, it totally works. The tahini mustard is not to be missed. 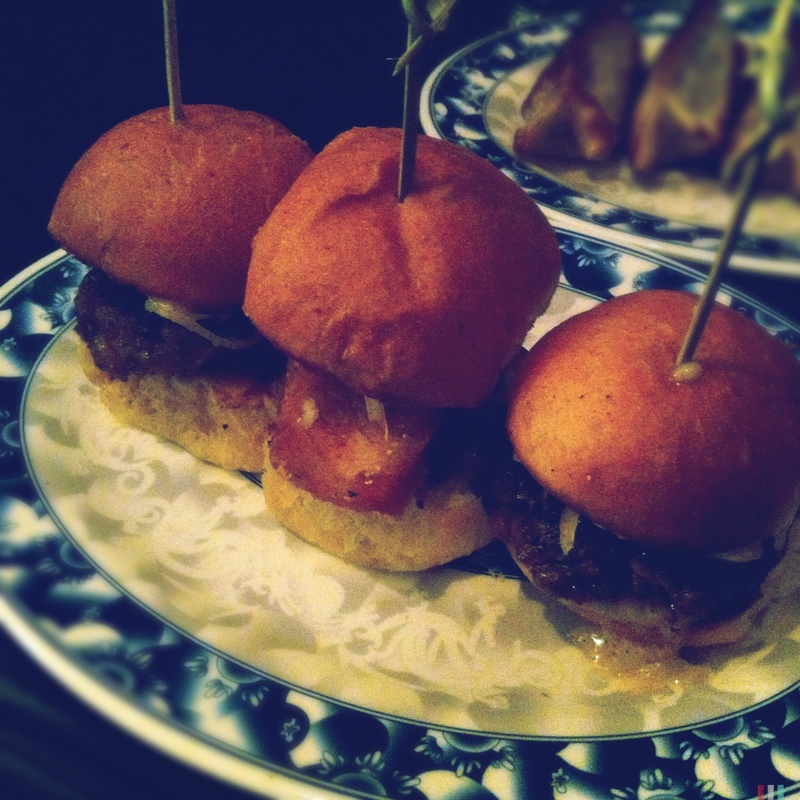 Hawaiian Bread Buns with Filipino pork sausage, garlic vinegar mayo & pickled shallots – Another great dish. The house made buns were sweet & light, the sausage deeply flavorful. A knockout in two bites. Hawaiian Bread Buns with fried fluke, garlic vinegar mayo & pickled shallots – This was the very best kind of fish & chips fish on a roll. Buttery, crispy, not too much batter – delicious. 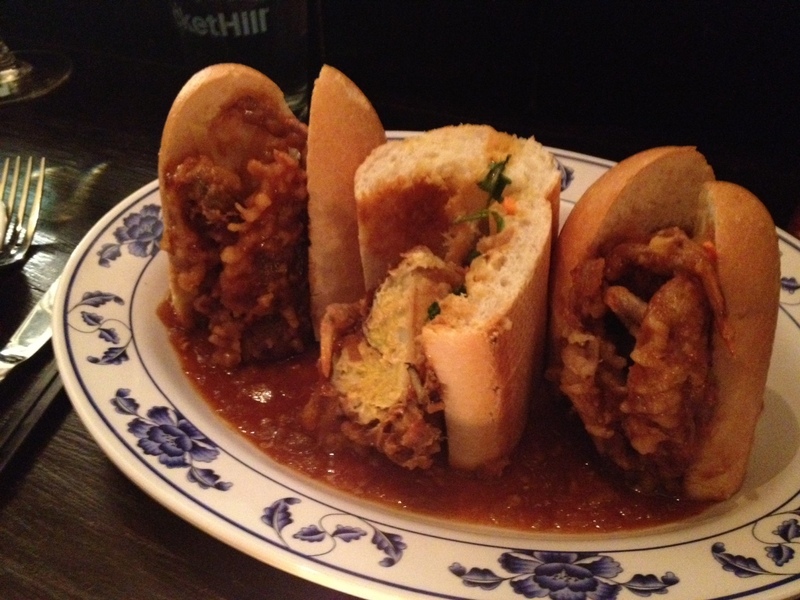 Singapore Chili Soft Shell Crab Banh Mi – Crazy good crab that actually had taste. So often with soft shelled crab, the crab taste disappears. That was not the case with this dish. This sandwich managed to taste just like a Banh mi (with the pickled carrot, cilantro and sturdy French bread) and yet somehow all it’s own (thanks to the crab and hot/sweet chili sauce). Another winner. 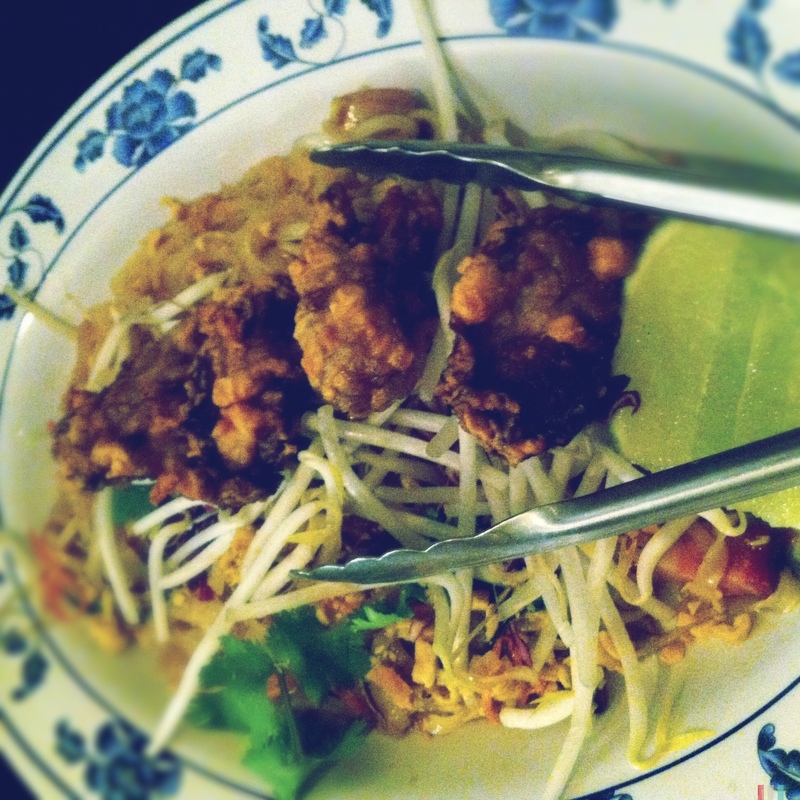 Crispy Oyster & Bacon Pad Thai – This dish made my DH wow. I danced in my chair. Perfect char flavor and finally enough acid in a pad Thai that we weren’t scrambling for the vinegar sauce. The oyster was great; a real gem, but didn’t quite mesh with the rest of the dish. If you don’t like bacon, don’t order. The bacon is rich & double smoked – the first bacon bite informs the rest of the dish. Lots of reclaimed sculptural wood murals, cozy and snug. A great date or night out with a few friends place. This was a knockout meal. We were fortunate enough to get to sit at the chef’s bar overlooking the kitchen, and the kitchen was running like a well oiled machine. It was also nice to see ‘he of the restaurant’s name’ working the pass. The food was amazeballs; my only gripe is that by the end of the meal, all that salt really caught up with me and I thought I might explode. A small gripe to be sure, but one worth noting for the salt sensitive. No single dish left me thinking ‘too salty!’ This was a cumulative effect. 5 out of 5. Run, don’t walk. Wait an hour if you have to – it is worth it. UPDATE (07.13) – The 5 still stands. 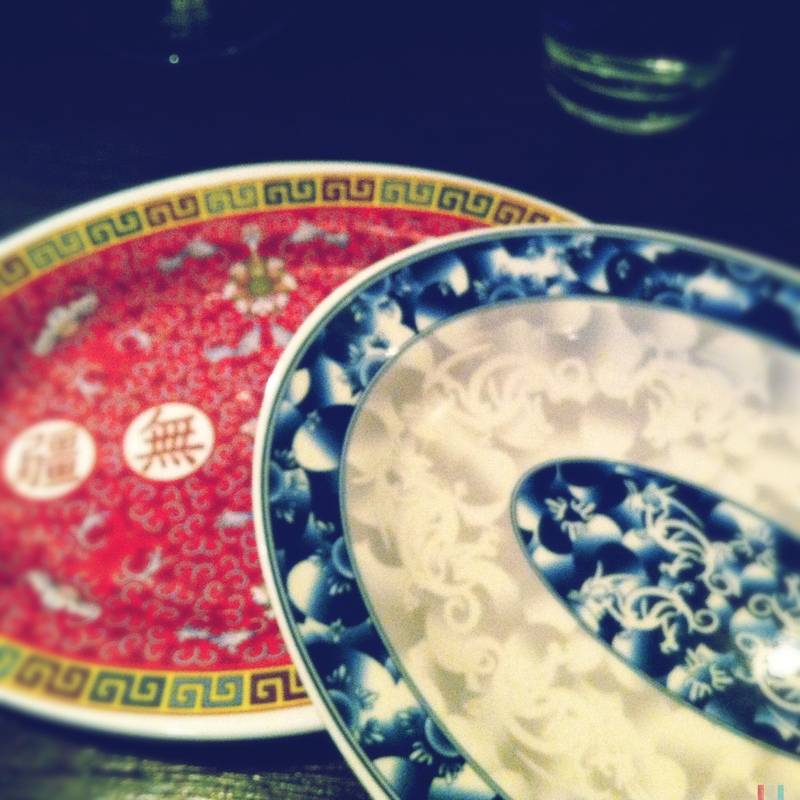 Talde has become our go-to dinner spot (or brunch! Bacon & Egg Ramen with Buttered Toast Broth FTW) and the first place we take out-of-towners. On the weeks I don’t post a review, it is most likely because we went to Talde instead of somewhere new. Sometimes multiple times in a week. Plus, most times we visit, Chef is in the house and he is one of the most gracious restaurant owners I have ever met. Needless to say, he has won our support – and repeat business – time and time again.